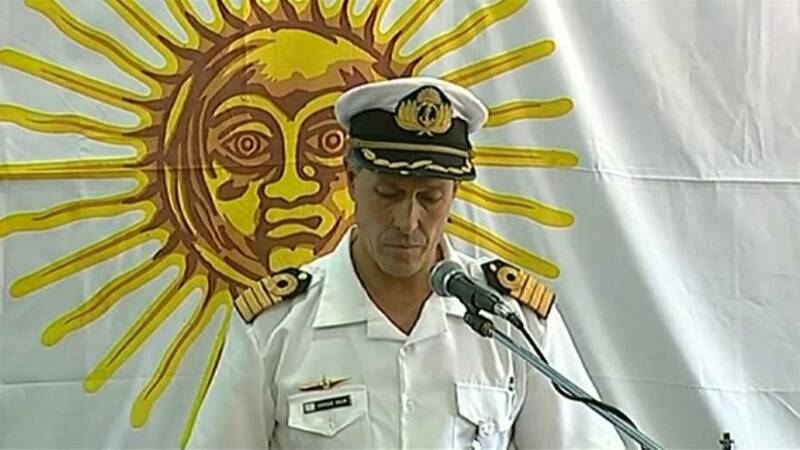 The Argentine navy raised the possibility on Thursday that a navy submarine missing in the South Atlantic suffered an explosion, heightening concerns over the fate of the 44 crew members. An abnormal sound detected underwater by an international agency on the morning of Nov. 15, around the time that the ARA San Juan sent its last signal and in the same area, was “consistent with an explosion,” navy spokesman Enrique Balbi told reporters. The navy did not have enough information to say what the cause of the explosion could have been or whether the vessel might have been attacked, Balbi said. A huge sea and air hunt is being conducted for the San Juan, a German-built, diesel-electric powered submarine that was launched in 1983, as crew members’ relatives wait anxiously for news more than a week after the vessel disappeared. The relatives, camped out in a naval base in the coastal city of Mar del Plata, have been largely optimistic until now, but they shed tears and insulted authorities after being briefed on the news of the possible explosion. The submarine was en route from Ushuaia, the southernmost city in the world, to Mar del Plata, some 400 km (250 miles) south of Buenos Aires, when it reported an electrical malfunction shortly before disappearing. The vessel had seven days of oxygen supply, meaning the crew would be running low if it had not been able to surface. Some relatives have questioned authorities for letting the crew navigate on an ageing submarine – criticism that has highlighted the armed forces’ dwindling resources since the end of a military dictatorship in the 1980s. Authorities have said the level of maintenance, not the age, was what mattered, and that the vessel was in good condition. It received a major mid-life upgrade in 2009, in which its four diesel engines and electric propeller engines were replaced, according to specialist publication Jane’s Sentinel.